August 12, 2002 If a parrot lived at the Cherokee sight, he’d be able to say “sand it again”, “one more coat”, and “git, Casey!” The pilot house is looking spiffy, with a completed electrical cabinet and adjacent cooler. 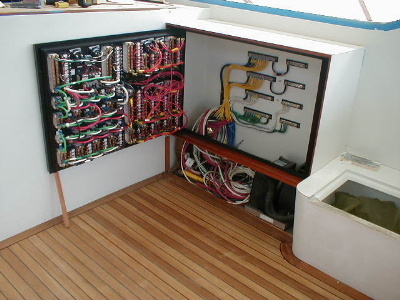 The breaker panel on the electrical cabinet swings out for easy wire access. Steve Gilpin is not only a first rate electrician on such projects, he is also plying us with his home-grown garden tomatoes and banana trees. 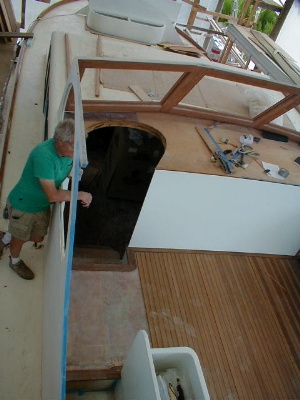 The crew has begun cutting and laying out the teak decking. 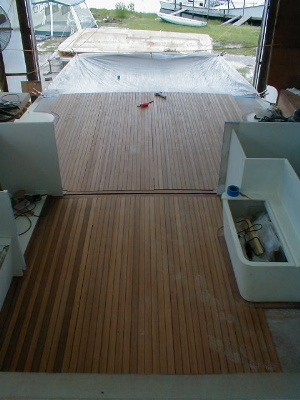 The decking visible above has been glued down, while the aft decking (shown below left) is fitted and prepared for gluing. 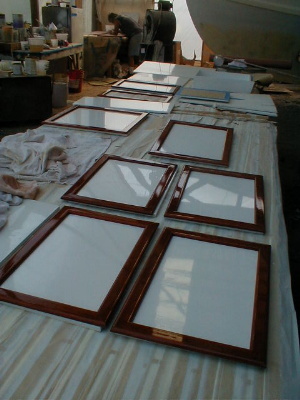 Interior doors are being sanded, varnished, and hung. 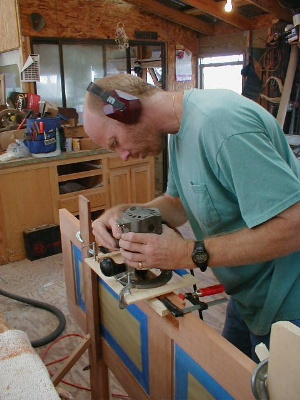 Below, Tom is letting in the locksets for the pocket doors. 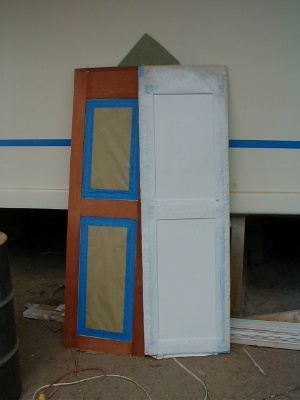 The doors are then taped so the inside panels can be painted white and the outside portion can be varnished. 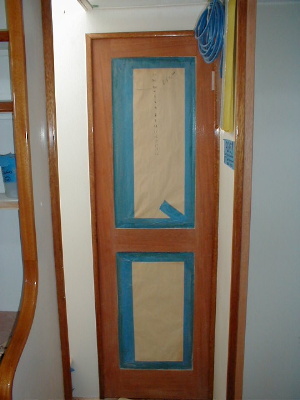 The first doors have been hung in the master stateroom and guest room. 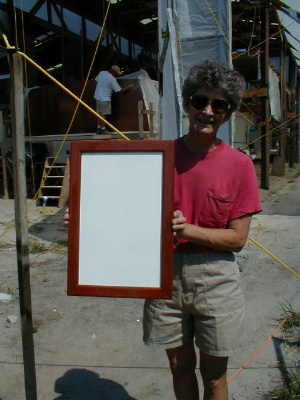 Jeanette has been working tirelessly on the cabinet doors and paneling. Below she is holding a door panel up for all the world to admire, with many more lined up beneath. Tom has begun installing the sprinkler system. 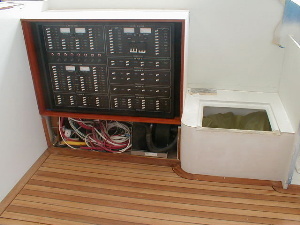 Below left is the supply from the boat’s domestic water. 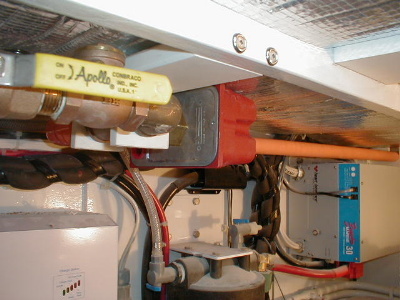 The red rectangular box is a flow alarm that will alert anytime the sprinkler system is flowing water. 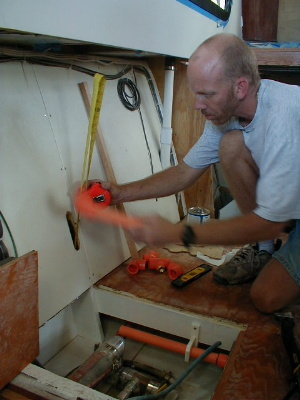 To the right, Tom brings up one of the legs of the Blazemaster CPVC pipe that will supply the aft part of the boat and the galley. 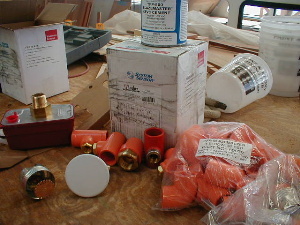 In the lower left-hand corner of the bottom picture is the round white plate for the concealed pendant sprinklers, next to an exposed sprinkler head.